Speech is something which normally develops in the first three years of life. But sometimes there are kids with speech disorder where the development is significantly delayed and underdeveloped. When a speech disorder is identified it is important to address the disorder as soon as possible, preferably when the child is between 4 to 6 years old. For these children is very important to do speech exercises to improve their skills and go beyond their limits. These exercises are normally supervised by speech therapists. But the accessibility and time spent together can be limited and irregular, which can affect the progress of the child’s speech development. Is also true that if a child fails to convey his message once, he might give up and stop trying. For this reason it is important that kids with speech disorder do not stop talking and are motivated to express themselves through speech. Kids with speech disorder require extra attention in order to prevent to disrupt their social development and causing difficulties into adolescence. These children can get valuable support through stimulating speech exercises. A toy that represents a valuable support to speech therapy is Ploppi’s Bakery. It is a pedagogic tool developed together with speech therapists for kids with speech disorder between 4 to 6 years old. Ploppi’s Bakery allows to extend the child’s speech training by professionals to a home environment. Traditionally, the child has to be pushed by his parents or his speech therapist to perform these exercises, but it always feels more like homework than play. This creates a disconnection between the child and the exercises, resulting in poor speech development, and later on even slow learning and poor social development. This relationship is shifted in Ploppi’s Bakery; the child engages himself through reacting upon the cue sent out from the parent. The child is asking instead of being asked to do daily speech assignments. So, how is it possible? Thanks to Ploppi’s Bakery the dynamics of the play change and so these speech exercises are fun and make speech development a better experience for the child. In fact, Ploppi is an interactive hungry plushy monster and it is also a good companion. The children can play with it all day and it help him to complete his speech exercises, once the time is right. When the parents activate the app, Ploppi send out a rumbling belly sound. To help the hungry Ploppi, the child has to bake cookies which can be fed to Ploppi. The only way to do this is through performing speech exercises. The kit consists of an interactive plushy monster (Ploppi), a book explaining the Ploppi’s story, a set of interactive tokens (cookies) to feed him and a tablet application that controls a series of customizable speech exercises. 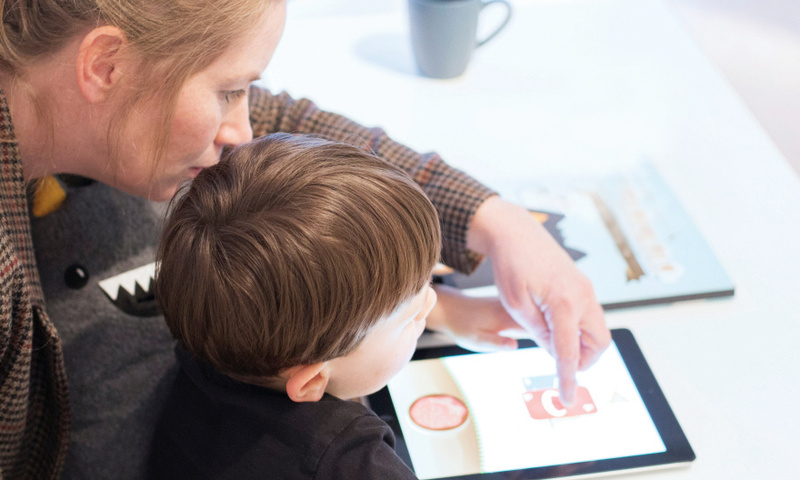 The application is controlled by the parents and modified by the child’s speech therapist. The speech therapist assists the parents in setting up the application and creating a combination of tasks which are personalized on the child‘s level. The cookies are interactive tokens which interact with the application and activate assignments when placed on the tablet. The only way to have the cookies is through completing the speech tasks in the app. The child, wanting to help his friend, will complete the speech exercises, changing the dynamic of speech exercises at home and reversing the rules. When the task is completed, the child can feed the cookie to Ploppi. In this way the child believes the initiative comes from himself and not from the parents. This shift in initiative will trigger the child’s motivation, joy and development when performing the speech exercises. This experience is not only designed for the children, but also for the parents who, following the speech therapists’ advices, are always in control. It allows to engage the family as a unit and supporting the child with speech disorders. Ploppi’s Bakery creates opportunities where parents and child can bond through speech development and play. So Ploppi’s Bakery assists parents to practice speech with their children, report back to speech therapists and create a routine and clear structure to the child’s speech therapy. Ploppi’s Bakery offers the child appropriate support and conditions to practice speech. The speech exercises and setup of the app is created to be adjusted to the child and to create new challenges as the child progress. The time of each session, based on exercises build around the phonetic alphabet, is maximum 15 minutes. The first exercise will be easy, followed by a more advanced and ending with an easy. In this way the child will end the session with a positive experience, and the focus from the difficult task. It is important to keep the child motivated and willing to always return to bake cookies and practice speech. Ploppi is designed to encourage the child to play and connect with Ploppi also outside of the speech exercises. The child will build an empathic bond with Ploppi and subsequently will feel a stronger will to feed Ploppi when its stomach is rumbling. In conclusion, Ploppi’s Bakery is not only an interactive toy. It is a complete environmental playful experience that uses storytelling and play, along speech exercises to capture the child’s attention, engage him with the exercises while creating joy, and deliver meaning in the form of speech therapy that opens up for parents to give their child appropriate attention and support in his social development.